Sometimes I forget about Dahlia and head straight to JOY and Fever for my pretty dress fix. I really need to stop doing that because Dahlia's new Autumn range is so precious. Look at all of these lovely things that will go perfectly with thick tights and things you've been mulling while there's a Poirot on the telly. I'm wary about wearing mustard, but it's a colour (and condiment) that I absolutely can't resist. 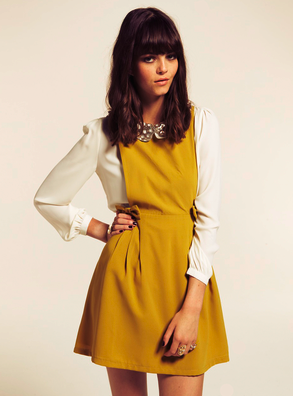 This mustard pinafore dress (£65) is perfect for the confusing weather. Wear it bare-legged when it's warm and then with a white blouse and deep reds and opaques when it gets a little cooler. I'm not sure this super-short navy prom dress is entirely practical in the very cold months, but I still want to twirl about in it. It's actually got built in shorts, so you won't be in danger of flashing anyone. Picture it with deep purple tights and suddenly it's a winner for Autumn's sunnier days. It's £75. I also really like her hair. I can totally see this pleated dress on Kat (who is fast becoming Autumn's biggest ever cheerleader). The Peter Pan collar and embellished cuffs are a lovely touch and deep reds are the easiest to wear in Autumn. Instant chicness, right there. Especially with a pleat of two. This dress is £66 and definitely my favourite for office cosiness. Why do most dresses have to be so short?! I'm just jealous. The ARE short, aren't they? I don't mind so much since I'm always in flats so tend to flash a little more leg than I should to make up for it. We'll look for some ace dresses a little longer, promise.